The Prothonotary Warbler, formerly named the “Golden Swamp Warbler” because of its striking plumage and partiality to wooded swamps, acquired its current name from 18th century Louisiana Creoles who thought the bird’s plumage resembled the golden robes of the protonotarius, a Catholic church advisor to the Pope. It is found during the breeding season in much of the eastern U.S. especially in the lowlands of the Mississippi Alluvial Valley. The Prothonotary Warbler is the only eastern warbler that nests in cavities. It is present in Tennessee from early April to early August. A small songbird with a deep golden yellow head and chest, a bright black eye, solid gray wings, and white belly and undertail. The female is slightly duller than the male. This species spends the breeding season in wooded swamps and bottomland forests of eastern North America. They may nest along more heavily wooded lake edges in Tennessee. This bird forages by hopping through low vegetation, on the ground or on tree trunks. Its primary diet includes insects and spiders, but also snails. The Prothonotary Warbler is the only cavity nesting eastern warbler. Upon arrival of the breeding grounds, the male selects at least one tree cavity, such as an abandoned Downy Woodpecker hole, and places a few sprigs of moss inside prior to attracting a mate. Once a pair is formed, the two will enter and exit the potential nesting site, until approved by the female. Once approved, the rest of the nest is built by the female. 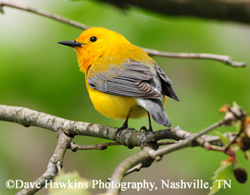 About half of Prothonotary Warblers in Tennessee will attempt a second brood. 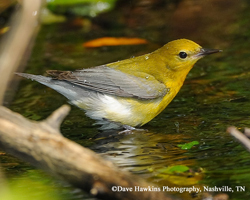 Because the Prothonotary Warbler usually nests within a few feet of the water's surface, flooding can account for substantial nest failure in some years. Nest: materials include mosses, liverworts, plant down, bark lined with grasses, poison ivy and fishing line. Clutch size: usually 5 white eggs with rust or lavender spotting. Incubation: by female for 12 to 14 days. Young leave the nest after 10 days. Adults continue to feed the fledglings for 3 to 4 weeks. If a fledgling Prothonotary Warbler lands in the water after its first flight, it can swim to safety. The Prothonotary Warbler is one of only two warbler species that breed in cavities. The other species is Lucy's Warbler found in the southwestern United States. Two box designs are readily accepted by Prothonotary Warblers. Preferred box design for Prothonotary Warblers is slightly smaller than the NABS Eastern Bluebird box with a 1 ¼ inch entrance hole. This box design may also be used by Carolina Chickadees, White-breasted Nuthatches, and House Wrens. The NABS box for Eastern Bluebirds is also a good box design for Prothonotary Warblers, but the entrance hole needs to be only 1 ¼ inches rather than the recommended 1 ½ inches for Eastern Bluebirds. A predator guard is highly recommended. •	Use natural, uncoated wood such as cedar or redwood which are more durable than pine or exterior plywood. Use at least ¾ inch boards. •	Never include an under-the-hole perch. •	The roof should provide sufficient overhang beyond the box entrance or vent holes to protect the birds from the elements. •	The roof should have a minimum of ½ inch overhang at the back. •	The nest box must have watertight construction at all seams. •	Cross ventilation is strongly recommended. •	Include one hinged, side panel that opens for easy monitoring and cleaning. Prothonotary Warblers readily accept artificial cavities (nest boxes) when built to the above specifications and placed in the proper location. Place your box over shallow water or near the edge of a lake/river, with the entrance hole from 5 to 8 feet above the ground or water surface. If installing more than one box, place boxes 300 feet from each other.